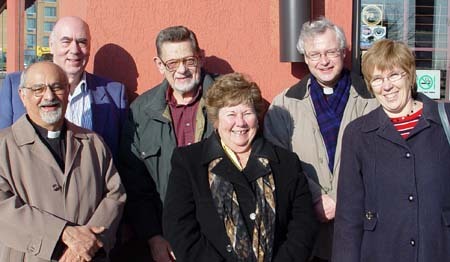 This great adventure, the pilgrimage of a lifetime for me, began with the group pictured below, a few of the members of the governing committee for the Scholarship of St. Basil the Great, and the staff of the Anglican Foundation of Canada -- whose efforts on my behalf, along with the generous support of the Cathedral Community in Quebec City, made this Ecumenical Pilgrimage possible, and I remain sincerely grateful. 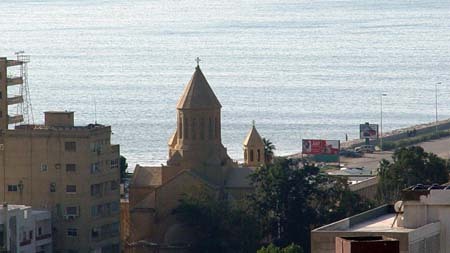 The focus for the first stage of this Ecumenical Pilgrimage was the Catholicosate of the Great House of Cilicia, located in Antelias, a suburb of the sprawling city of Beirut, Lebanon. Here I enjoyed three very full months as a guest of His Holiness Aram Vehapar, Catholicos, leader of one of one the two main branches of the Armenian Apostolic Orthodox Church. It was a great honour to be invited to live and work as a part-time teacher at the Seminary of the Catholicosate of Cilicia in Bickfaya, Lebanon. 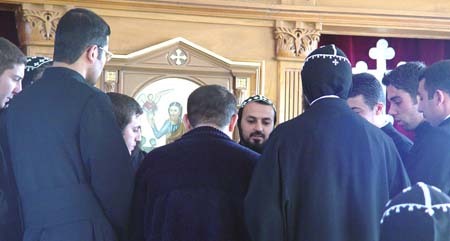 This represents easily the best part of my pilgrimage experience among the Armenian Orthodox of the Middle East. 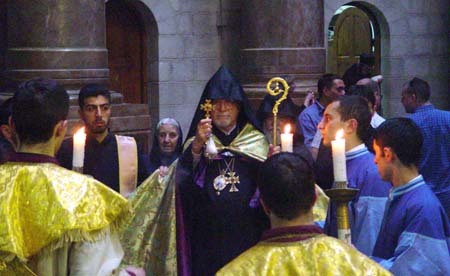 Living among the Armenian Orthodox of the Middle East, the range and depth of liturgical expression and the fullness of the Spirit that permeates the life of this Apostolic community impressed me above all else. Among the many blessings of these four months in the Middle East, certainly the discovery of the small Anglican community in Beirut ranks high on the list. Pictured here, new friends, Sarah and the Revd Nabil Shehadi, the welcoming heart of the International Congregation at All Saints Anglican Church, Beirut. 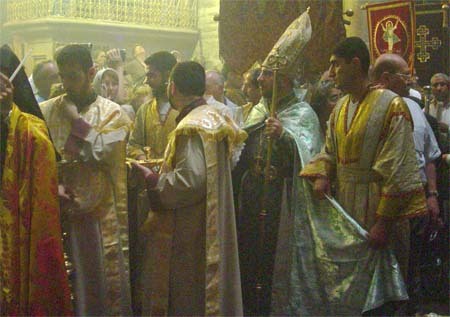 The Armenian Orthodox are members of the great family of the Oriental Orthodox Churches. It was a tremendous privilege visit with the Syrian Orthodox Apostolic community in Ma’arat Sayyidnaya on the outskirts of Damascus, where I enjoyed the gracious hospitality of His Holiness Zakka, Patriarch of Antioch, one of the giants of 20th century Christianity. 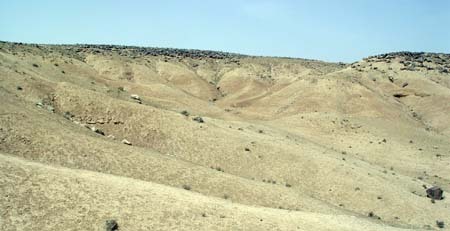 At the very heart of this Ecumenical Pilgrimage, a journey to the depths of the Syrian desert, to Marqadah, and its "Valley of Dry Bones," where the lives of thousands of Armenian Christians were extinguished in one of the cruellest and most cold hearted crimes of the twentieth century: the Armenian Genocide of 1915. Nearly two million Christians -- Armenian for the most part, but also Greek, Syrian and others -- were targeted for extermination by the Ottoman Turks, and to this day Turkey has failed to express even the slightest regret for this sinister chapter in the history of human civilisation. Yet it is the heroic and resurrected Armenian people that I have had the privilege of getting to know over the past four months ... the most hopeful expression of which is found in the newest generation of Armenians, like my fellow pilgrims, the seminarians pictured above. 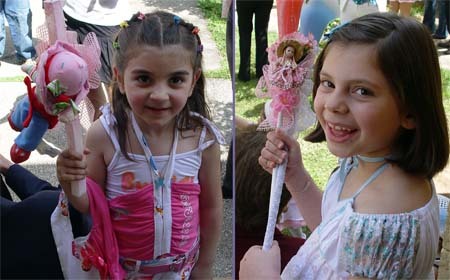 Proud of their Armenian heritage, they are talented, fun loving, industrious ... and ready to meet the future. 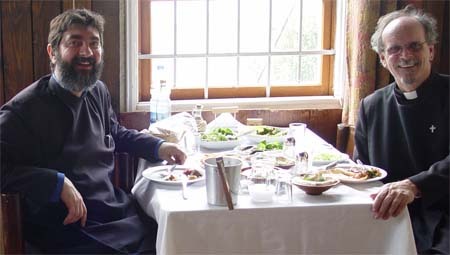 Perhaps the single most important lesson I have learned during the past four months, is the joy of opening one's heart and home in the gracious art of Middle Eastern hospitality. 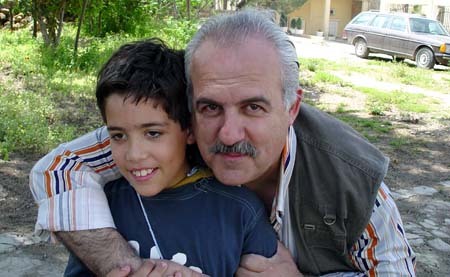 Georges Khoury, pictured here with his son Octave, who welcomed me to the North of Lebanon, is one of many I have met who are masters of the fine art of hospitality. George, along with the members of the monastic brotherhoods of Antelias and Jerusalem, and so many other wonderful hosts along the way, have really made me feel at home in the Middle East. 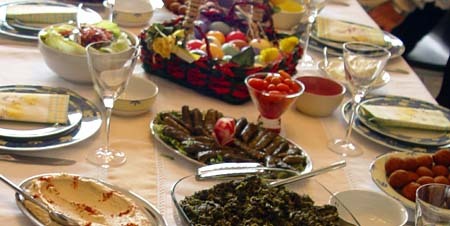 And words cannot describe the wonders of the Middle Eastern cuisine ... simply exquisite. Surely the finest gift that I have received, over the past four months, is the friendship of the many who have so richly blessed my experience of Middle East. I am particularly indebted to Fr. 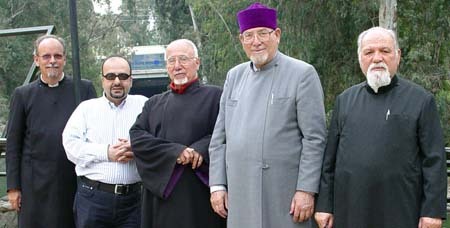 Krikor, Dean of the seminary in Bickfaya. Fr. Krikor has been my advisor, tourist guide, tutor and very good friend. Over the last month of the pilgrimage, it has been my great privilege to make friends with many in the extended family of the Armenian Patriarchate in Old Jerusalem; and I have grown particularly fond of Fr. 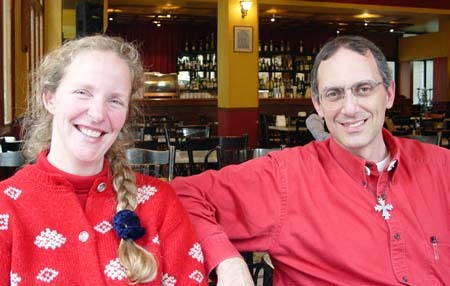 Kegham (ker-ham), pictured right, my walking partner after supper most nights exploring the streets of West Jerusalem. Friendship is the most beautiful bridge that can ever be built between people of different languages, cultures and faith traditions. When nation, party, and religion become more important than friends, then the outlook for our world seems very bleak indeed. I am particularly thankful for the gift of friendship so generously extended to me from so many in the Middle East. Despite the political and ecclesiastical tensions that seem at times to compromise the unity of the Armenian people, the bond of language, history and community remains the greatest source of Armenian strength. 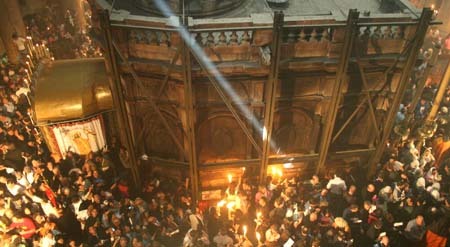 One cannot speak of pilgrimage without reference to the ultimate focus of Christianity, life itself. In many respects, this sabbatical leave for me has been one of rediscovery, focusing anew on that essence of faith that so encourages and sustains us, and this rich harvest of the Spirit that is called "life in abundance." The life and culture of the Armenian Orthodox, and that of so many in this region, turns around the central axis of faith -- the dynamic and vital belief that the Spirit is the essential sustenance of life at its fullest. 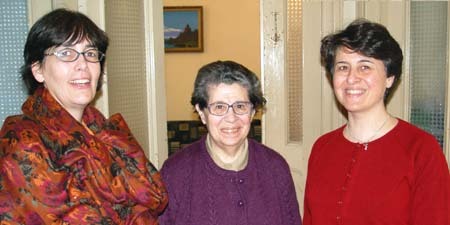 Among the Armenians of the Middle East, I have been deeply nourished indeed, and I return to my own "middle world" with a fresh outlook and a renewed commitment to recognize and rejoice in the abundance of the Divine Grace so freely given us, and to seek and serve the Lord Christ particularly in those I meet.